Dustin Spiring was not recruited by the University of Manitoba like most athletes. “I never expected to play volleyball at all,” he said. Everything changed when former Bisons assistant coach, Ryan Ratushniak, asked Spiring to help the volleyball team with video and stats during practices. When Bisons head coach Garth Pischke returned from sabbatical the following year, he asked Spiring to continue helping out. “He asked me to do video again kind of, but be on the team and be part of the team, so I actually got to roster that year,” said Spiring. Spiring said Pischke provided him with the opportunity to succeed. “I came into practice every day willing to work hard and do whatever I needed to do to get on the court,” said Spiring. Injuries plagued the Bisons squad during Spiring’s second season, in 2016, which resulted in him lacing up for playoff games. Spiring said he worked on his body between his second and third years to get stronger, which helped him get more playing time. In his third year, Spiring played in his most memorable game as a Bison. The final of the 2017 Canada West Final Four was played at Investors Group Athletic Centre against the Trinity Western University Spartans on Mar. 11. “Second set, when we won that set, that was probably my favourite moment as a Bison ever in my history here,” said Spiring. 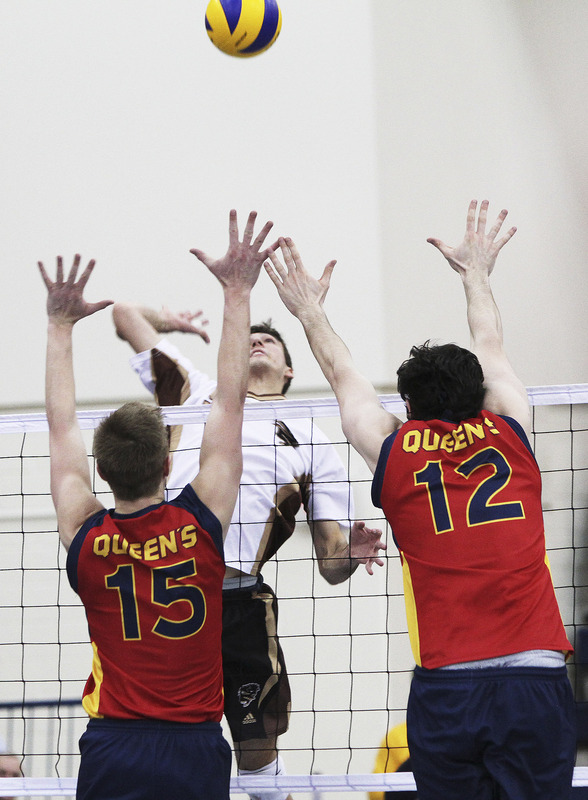 Manitoba was down 27-26 before scoring three straight points to win the set. Spiring served the final two balls of the match. “It was amazing,” he said. The Bisons lost the finals 3-2, but Spiring said the veteran players he played with that season have influenced who he is as a leader today. “I try to take a lot from guys in the past,” said Spiring. “Kevin Falconer was a big leader, his work ethic was amazing, and Kenny Rooney was a great leader, he was a captain in his second year. Spiring is the lone fifth-year player on this year’s team and plays every set. “It’s definitely making me feel like an old man sometimes in there with all the young guys, all the 18/19-year-olds,” said Spiring. Spiring is now focused on completing his education but will not close the door on playing volleyball in the future. “If I had the opportunity, I’d love to do it,” said Spiring. “I want to finish my degree next year though and get that out of the way. I don’t want to have to come back to school after, if I were to pursue some sort of volleyball. Spiring graduated with a degree in physical education from the faculty of kinesiology and will be finishing his education degree in the next school year. Regardless of where he goes following graduation, Spiring is aiming to remain in a classroom. “Phys-ed and geography are my major and minor, but I’ll teach anything,” said Spiring.